After the fallout in Week Five, I was out for a redemption week. 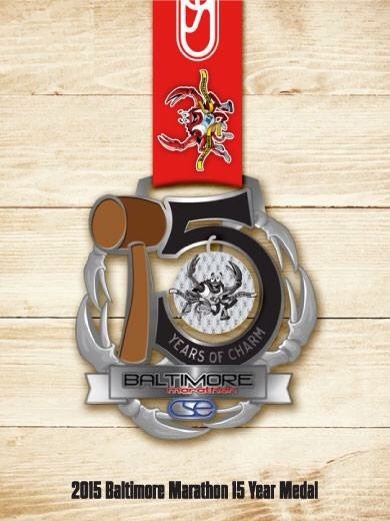 Week Six means that, come this Saturday, the Baltimore Marathon is in 12 weeks. I have 3 months left to train for my 4:00 marathon, and I can’t do that if I am barely meeting 20 miles per week. Usually, the common training wisdom is that, if you miss a few days and you mess up your schedule, if it’s a missed 2-3 days, pick up where you left off and continue on with an easy-paced run to get back into the groove. You’re “allowed” to miss a long run once or twice and, while it’s definitely the most important run, if you miss it, move on. But I couldn’t “just” move on because I am also using this training to train for possibly the Marine Corps Marathon, possibly the Rehoboth Seashore Marathon, and then the Dopey Challenge. I have three months to train for Baltimore then Marine Corps, another month to train for Rehoboth, and then a month later, I’ll be running 48.6 miles. That just feels like so much racing for barely having breached 20 miles per week in the first five weeks. I needed to be in the 30’s somewhere by now, and I’m not. As stupid as it probably is to go into panic mode at this point, I felt like the peace of mind of having actually acccomplished a higher number miles was what I needed most. My rule of thumb here will be to run what I feel that day and, if I feel like I can’t, then I won’t. But I wanted to try. I needed to try. The argument that running such low mileage this week is that I am rested enough to go for it, but that very same argument could also prove that I am pushing up too much too soon. But I’m still gonna go for it. Monday: Cross-training with Iron Strength Workout, 40 minutes. Truth be told, I suited up to run 5 easy miles instead of doing cross-training tonight. I’d have preferred to run. Today marked three days since I had gone running. I couldn’t handle that. But after suiting up, I went to get my iPod and earphones and realized they were missing. I searched literally everywhere for them. I keep my iPod and two pairs of earphones in a tiny coin purse and the last I remembered, I was coiling up my headphones and iPod to put away. I was in a familiar place– either it was at home or my office. The last time I used them was Friday and I switched purses sometime over the weekend. I don’t remember taking them anywhere that I’d have used them and left them behind. If this was a 3-miler, I’d have just gone without music. But it was 5 miles on a very very hot day. It was 94 degrees with a feels-like over 100 and a heat advisory. I needed some mental stimulation to get through a run in those conditions. I couldn’t switch days– I couldn’t run 5 miles and 6 miles back to back. So, I let go of the 5 easy miles and hung out with Dr. Metzler and his crew for 40 minutes. The second time around with this DVD wasn’t as difficult but still a challenge to get through. I skipped the Burpee and plank segment. Next week though. And I still haven’t found my iPod. Tuesday: 3 hilly, easy-pace miles at 10:22 average pace. One of the good things about living in my new neighborhood is that hill-training is built right in. 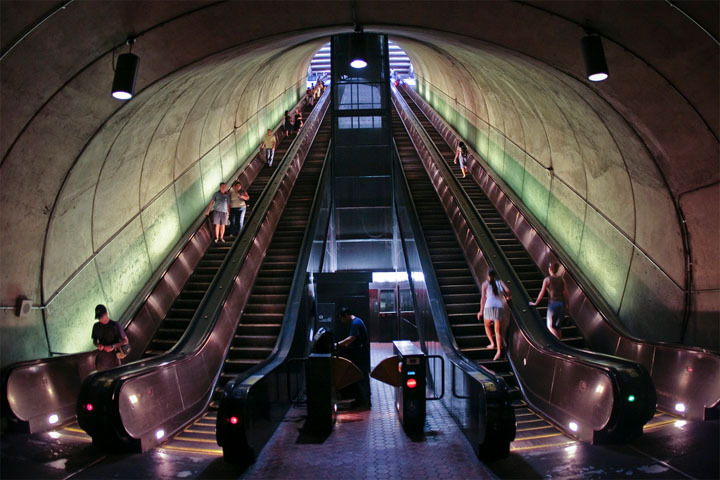 If you’ve ever taken the Metro escalator in and out of the Rosslyn station, you know that it is basically like scaling a wall. I’ve counted this climb: it is 90 steps from top to bottom that takes 0:54 seconds to climb or 2 minutes, 12 seconds to ride. Once you get out of the station, to get to my apartment, you have to climb up a pretty steep hill for about half a mile. It can be a real workout just getting around that neighborhood. This didn’t stop me from taking on the hilly Custis Trail for my 3-miler. I still hadn’t found my iPod, so I had to run without music. Thankfully, it was a short easy-pace run in slightly cooler weather. What a difference “slightly” makes. The only qualms that I had about this run was that my Garmin was having a terrible time tracking my pace. I know the difference between a 12:18 pace and a 9:28 pace, and I was not running the former despite the hills and what my watch told me. This was irritating– easy runs are all about purposeful slow running, and I found myself running medium-effort paces just to get my splits out of the 12:00’s. There’s something to be said about running by feel, and you can’t run solely by what the GPS says. If it conks out through the Baltimore Marathon, I have to be able to run how I feel and still manage my energy enough to maintain pace and meet my goals. There’s so much to marathon training than just running, isn’t there? Wednesday: 6 medium-effort pace miles at an average 9:23 pace. This run was pretty tough. Having run hills the day before, I didn’t quite want to take on the hilly Custis Trail but I figured that getting in some hills on a medium-effort run like this would be a good idea. I walked down to the Marine Corps Memorial, just about 10 or so minutes from my apartment, jogging at warm-up pace downhill. My calf hurt from the run the day before– I definitely should have foam-rolled before now. It was the first time I realized that I wasn’t quite out of the woods yet with the misalignment issues, despite not having felt them in weeks. Once I got going, it felt really hard to maintain my splits. I definitely burst through the first mile a little too fast, so I knew that I would have a tough time over the next several miles. The course for this run was an out-and-back, so to get myself through the miles (and 6 felt like a lot), I would say things like, two miles to the turn-around… one and a quarter and you can head home… one more mile and you’re halfway through. But even those mental tricks didn’t help. I had to stop a couple of times to calm down because it felt like I was panicking a little about maintaining pace. My breathing was really off. I was a mess. When I did finally turn around, I was hit with a gush of wind. Oh, great, I thought, that’ll make this much easier now. I wanted to quit a hundred times, but I knew I’d still have to traverse 3 miles to get home. This is why I don’t carry my Metro card or debit card for a cab while running: it’s a powerful negotiating tool when I want to throw in the towel. When I finally got back to the Marine Corps Memorial, after having walked up a hill (ugh, bad Sara! ), I was just too happy that it was behind me than proud that I made it through. Sometimes running is a chore. Let’s be honest. Thursday: Rest. Sometimes, it still surprises me that my legs can still feel sore. I run constantly and soreness says to me that I haven’t worked a muscle group in awhile. Maybe running hilly routes two days in a row was a good thing then. Friday: 3 easy-pace miles at 10:32 pace, 2 additional miles. Friday was a long hard day in my personal life. I won’t go into specifics, but let’s just say I was grateful that I could run on Friday. It was a pretty uneventful run– the fun started afterwards when I realized that my keys were missing. I still haven’t figured out how to carry my keys when I run– it’s annoying that I have to use a fob to get into my building, so I can’t just slip a key around my neck or something. They jab and poke me if I stick them in the pocket of my shorts and bounce annoyingly if I tie them on my arm band or SPI belt. On long runs, they go into a pocket in my water bottle carrier, so, for a short run like this, I carried them in my hands. After my run, I went to Safeway to pick up wine and food, including a watermelon and gallon of ice cream. But after checking out, it hit me that my keys had not been in my hand this whole time. I became that crazy lady who is dazed and confusedly retracing her steps around the grocery store, but they weren’t anywhere. I left the store with 6 grocery bags and nowhere to go to put them so I could walk the 3 miles I just ran and look for them. It was also right as the sun was setting, so I had maybe 20 minutes to go 1.5 miles to where I turned around and get back with my keys. I didn’t even know if I’d be able to find them– I was still convinced they were at Safeway– but I had no idea what to do next, so I stashed my groceries behind a bush in a neighborhood along my route and started another run. This time, instead of an easy pace run, I ran faster. I tried to turn on my Garmin so I could track my distance (hey, this counts! ), but I must have pushed the wrong button because it didn’t turn on. I guessed that I had just run about 2 miles at race pace. I also noticed that running with the sole distraction of looking on the other side of the trail for my keys was the perfect way to run fast and have it feel easy. Maybe a good racing technique? Luckily, after searching the grass near some trees where I stopped to take my ever-important running pictures, I found my keys. And then I ran home as fast as I could because my trail had become creepy and overgrown with gnats and bugs. I retrieved my groceries (the ice cream was okay!) and all was well, but it was definitely a lesson in humility. I admit it. Nap time. Friday was a long hard day for the both of us. Saturday: Rest. Saturday morning, I was feeling pretty low. I’m realizing more as I grow up that life is hard. It’s really freaking hard. It’s hard to realize that I’m living a nightmare when at one time, I had my dream life. Right now, my struggle is looking at what I lost and reconciling it with what I gained. Frankly, it doesn’t stack up at all, and I feel like I got genuinely screwed over despite my best efforts, which included faith, hope, love, hard work, and prayer. It’s a pretty dark place to be in and I was having a hard time pulling myself out of it. I didn’t want to be in “the dark place.” Regardless of whether I really did get the short stick or am having one of my “woe is me” days, I hate being in that place. When I’m in that place, in order to get out of it, I do anything– literally anything– to get through the day. Go shopping, go see a movie, get out of town– even if I’m just driving somewhere else. Saturday, I decided to take myself to North Beach, Maryland. It was the perfect solution to get me out of my terrible funk. I didn’t get there until about 1:30, but the minute I stepped out of the car, I could smell that briney smell of sand and water. Gulls screeched, the faint scent of sunscreen mixing with funnel cakes. North Beach is on the Western shore of the Chesapeake Bay, about an hour east of DC. It’s not quite “the beach” but it’s close enough. For hours, I sat on the sand listening to my beach playlist called “My Happy Place,” which is a lot of Kenny Chesney, some Marley, and really any song that gives me that summer blissed-out feeling. After a few hours in the sun and walking the pier, I considered going for a run along the boardwalk. It was pretty crowded and I found out as I walked back to my car that I had been parked illegally for the whole day. Whoops. I drove around to the public parking lot, but it was full as it had been the entire day. Knowing I had to wake up early to run long, I called it in. Saturday was a very much-needed time out. Beach time always puts a smile on my face. The fishing pier at North Beach on the Chesapeake Bay. Sunday: 13 miles at an average 10:20 pace. Sunday was expected to be really hot and humid, plus I had plans for the afternoon, so I knew that my window to run was early in the morning. I set my alarm for 4:30AM but didn’t get out of bed until almost 6AM– the time I had wanted to be out the door. I had fallen back asleep and slept through 2 alarms. Mornings are very, very, very hard for me. I have tried for years to become a morning runner, but my sleep monitor usually shows that my deepest sleep is between 4 and 6, so it’s a tough battle for me. I got out of bed, made some coffee, filled a Nalgene, and sat muching on Pop Tarts, glassy-eyed, watching “Scandal” until I felt awake enough to go. I also feel nauseous in the mornings, so eating and hydrating when I want to hurl is also hard for me. I couldn’t not hydrate or eat, not before a 13-miler. I didn’t actually leave until almost 8AM. The morning was still kind of cool, but I knew better than to let it lull me into thinking it would be a cool run. Once I got going, I felt like I was laboring a little too much. My legs felt heavy and stiff and my breathing was frequent and short. I couldn’t believe I was going as slow as I was– I felt like I was running faster. It’s never a good sign when you have to stop at mile 4 of a 13-miler to stretch your hip flexors and generally pull yourself together. Yet that’s what I had to do. My water bottle was also around halfway full so I knew I’d have to stop and refill it at some point. Not good signs. I stopped several times along my run to just catch my breath and rest. I really never, ever do this. I don’t know what was my problem here– was it because I had missed a long run last week? At the turn-around, the wind that had been in my face and cooling me off until mile 6.5 was suddenly absent and I could feel the full weight of the sun on me. My trail was patchy with some shade that provided some relief, but there were also long stretches of shadeless trail that I had no choice but to run. I’ve definitely run easier and more enjoyable 13-milers, and this one just sucked. I stopped an awful lot. I wonder if that was what helped keep my paces somewhat within long-run range. It felt like cheating, especially when my last 2-3 miles were below 10:00. It was a brutal run, one that I didn’t finish until almost 11AM. 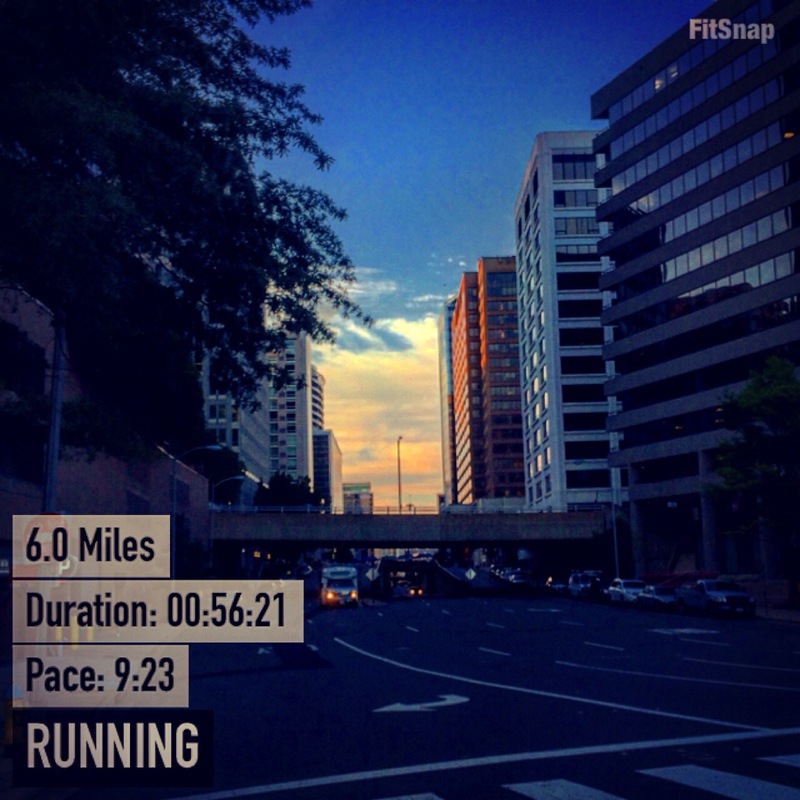 That’s far too late in the day for a long run in the DC summer heat– nearly 7 hours after I had wanted to wake up. Yes, I got it done, but it felt like paying full price for a used car. Gotta remember how hot this run was so I get up earlier for next week’s 15-miler. Recap: My goal this week was to reach 30 miles, and I fell short yet again at 27 miles. At Week Seven on my doorstep and with officially 3 months before the race, I feel like I should have been at 27 miles in my first 2-3 weeks. I’m honestly disappointed in how my training is going. I like having a cross-training day to mix up my fitness, but I don’t feel like I am running enough. I don’t have that “hurts so good” exhaustion from marathon-training. With 12 weeks left, maybe it’s a good thing that I’m not feeling famished right now, but regardless, I don’t feel like I am doing enough and that is starting to generate a little mid-training panic. This is the part when I would tell myself to trust my training, trust the plan, but I have made many modifications to my training plan along the way. Maybe this is what I need to get my 4:00 goal, maybe I need more. I know I always say at the end of the week that I have to dig deeper and go harder, but this is really becoming a make or break mantra. Week Seven has to be over 30 miles and I can’t go lower than 30 for the remaining 12 weeks. Time to put my money where my mouth is.